The BT70s w/UNI-T is a premium All-Season tire designed for imported and domestic coupes, sedans and minivans. The BT70s features UNI-T, Bridgestone's Ultimate Network of Intelligent Tire Technology which is a comprehensive combination of advanced tire technologies. The BT70s was developed to emphasize wet performance while providing predictable handling, a smooth quiet ride, long wear and year round traction, even in light snow. On the outside, the BT70s w/UNI-T molds a uniquely formulated tread compound into a tread design that combines wide circumferential and shoulder grooves to create a pattern that delivers impressive wet performance (braking traction, cornering traction and hydroplaning resistance), long wear and a quiet ride. Internally, the BT70s w/UNI-T features Bridgestone's Computer Optimized Component System to blend casing shape, materials and construction, in which twin steel belts stabilize the tread area to enhance wet traction and wear while a polyester cord body enhances ride quality. 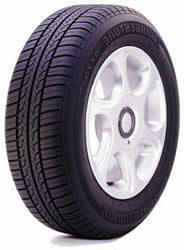 Depending on tire size, Bridgestone BT70s w/UNI-T tires feature white stripe or black sidewall styling. They are S-speed rated (T-speed rated only in the 215/65R15 size) and available in 80-, 75-, 70-, 65- and 60-series sizes for 13" through 16" wheel diameters.